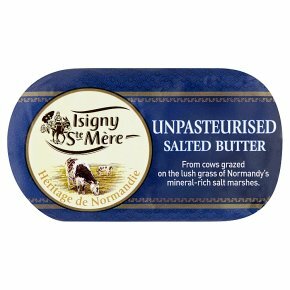 From cows grazed on the lush grass of Normandy's mineral-rich salt marshes.Made exclusively from raw milks, our Unpasteurised Butter is made from the best milks collected in the Isigny region (Normandie, France), which are distinguished by their exceptional richness in fat, proteins and vitamins. This Unpasteurised Butter is obtained by churning our best creams. These creams undergo a natural maturation process, which allows them time to develop all their taste and flavour notes. Our Unpasteurised Butter is, above all, a butter for connoisseurs: it is authentic and is the best of breed in its class. It is distinguished by its beautiful yellow-orangey tones and its unique and salty taste.